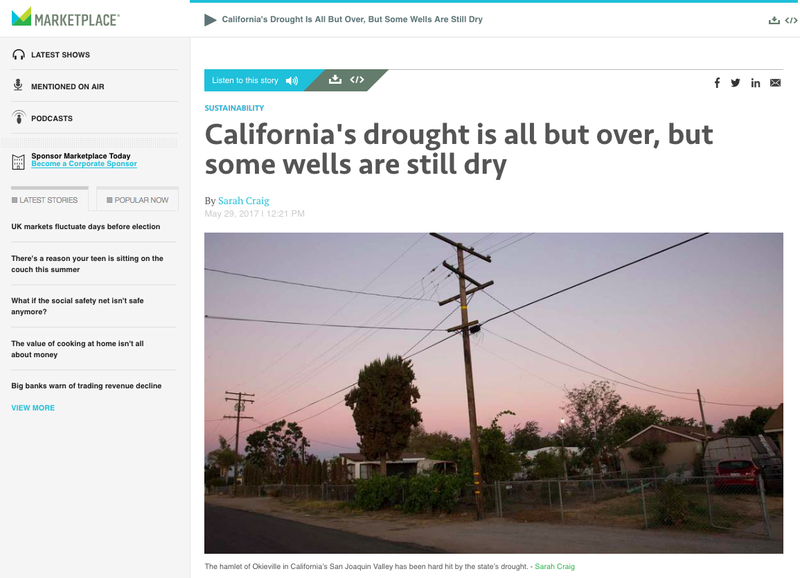 This story recently won a SPJ NorCal Award for best Science, Environment and Health reporting. Although heavy rainfall has made for a wet winter in Northern California, the drought is far from over in much of the state. The hard-hit Central Valley will need decades to recover from depleted groundwater levels. Less groundwater means dry wells and the Valley is home to ninety-two percent of the roughly 2,350 residential wells that are currently bone dry. If you zero in on the exact location of these wells, you may find yourself in a tiny community known informally as Okieville, roughly half way between San Francisco and LA. For working farm communities like that, issues of water scarcity or water contamination aren’t anything new. But for Okieville, failing wells have caught people’s attention outside the area. In their case, things needed to get worse, in order for the chance to get better. This story aired nationally on Marketplace and regionally at KALW in San Francisco. You can read the story online here.